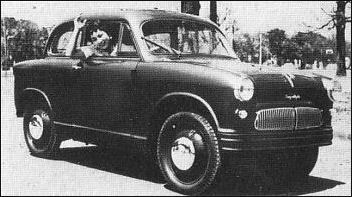 Introduced in April 1955, "SF" stands for "Suzuki Four-wheel car". Work had begun in January 1954, with a front-engine, rear-wheel-drive and rear-engined design also considered. The first Suzuki was closely based on the Lloyd LP400, chosen after Suzuki also having considered the Citroën 2CV and Renault 4CV. The Suzulight SF shares the Lloyd's transversely mounted, front-wheel drive layout and the two-cylinder, two-stroke engine is a narrow-bored copy of the Lloyd's, using the same 66.0 mm (2.60 in) stroke. It has drum brakes all around, is 2,990 mm (117.7 in) long, 1,295 mm (51.0 in) wide and 1,400 mm (55.1 in) tall, with a 2,000 mm (78.7 in) wheelbase and a 1,050 mm (41.3 in) front and rear wheel track. Because of the smaller bore and resulting 359.66 cc (21.9 cu in) engine, it meets the Japanese Keijidosha ("light car") legislation. It is designed by the company's founder Michio Suzuki. The SF has double wishbone coil-sprung suspension front and rear, with rack-and-pinion steering. Just like the Lloyd which inspired it, the Suzulight features a chassis consisting of a central tube with the suspension attached to each end of the tube. The introduction of the Suzulight SF series also dovetailes nicely with the "People's Car Program" recently announced by Japan's Ministry of International Trade and Industry (MITI), which established a goal for the Japanese auto industry of producing "a four-seater with a top speed of 100 km/h, priced at ¥150,000," in order to speed up motorization of the country. A fourth bodystyle, the SD Delivery Van, was added in November.